The German Residential Storage Market Is Booming. But What’s Up With Commercial? A lack of policy and market incentives has kept the country’s C&I market at a measly $7 million. The German behind-the-meter storage market stands sharply divided. On the one hand, residential storage boomed to $149 million in 2015, looming larger than almost every other residential market in the world. On the other hand, the commercial and industrial storage space, which far outpaces the residential market in the U.S., barely registers at $7 million. The weakness of commercial storage -- and utility-scale storage, only slightly larger at $13 million in 2015 -- is bizarre, because it occurs in a country that, from a macro level, seems an ideal candidate for widespread storage use. German retail electricity prices have surged in recent years. Meanwhile, the nation has chosen to shut down its existing nuclear capacity through the Energiewende (or "energy transition") policy, replacing it with intermittent renewables. Wind and solar now produce more than 30 percent of the nation’s energy. Normally, that would increase demand for storage to hold onto the energy from the peaks and save it for when the sun goes down and the wind subsides. But that hasn’t materialized in Germany, in part because of its regionally interconnected grid. It’s not advantageous to buy expensive storage when Germans can sell excess power to any of its many neighboring countries. That calculus may change as renewables continue to expand their market share and storage prices decline. In the meantime, the storage industry must pursue other value streams for its product. But when it comes to market incentives, homes have access to them and commercial sites do not. Retail electricity is already expensive in Germany; it has increased 47 percent for residential customers since 2006, and the feed-in tariff that compensates residents for the extra solar power they pump onto the grid has fallen below the retail rate. That driver does not apply to commercial customers, however. “While residential customers face high, and rising, electricity prices, large C&I customers can gain exemption from all or part of certain electricity levies, taxes and fees,” noted Simon, who recently authored a report on the German storage landscape. There’s even a self-consumption tax that applies to large solar systems, which means commercial and industrial customers have even less to gain from producing and consuming their own energy. It’s possible for a commercial storage market to thrive without the self-consumption model. The incentives for that don’t widely exist in the U.S., and yet the commercial storage market there stood at $74.2 million in 2015. But American businesses have something to contend with that German businesses don’t: high demand charges. Especially in California, these fees, levied on the highest peak demand within a month, can add up to half of a company’s electric bill. Storage allows for demand-charge management: customers can use software that predicts upcoming demand peaks and pulls from batteries rather than the grid, thus evading a high charge. 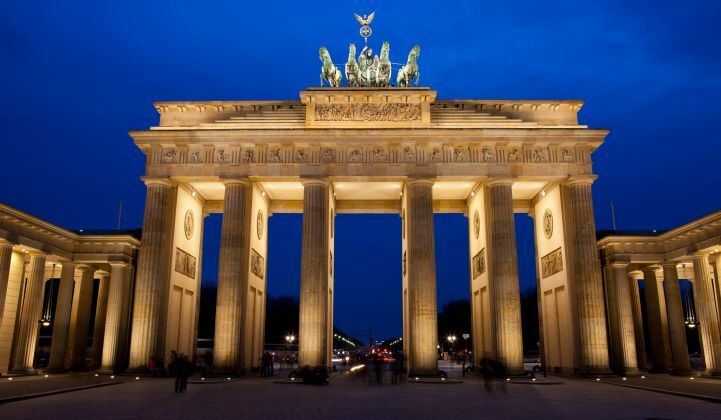 Germany doesn’t impose high demand charges, though, which leaves commercial entities without a clear means of recouping investments in storage, even if they wanted to use it. That could change, but it would require some reworking of the country’s electricity rate structures. Another possible avenue for C&I expansion is the growing field of virtual power plants, which aggregate distributed, behind-the-meter resources and bid them into electricity markets. They generally offer reduced-cost electricity to customers in exchange for access to their generation. Storage, historically, hasn’t played much of a role in Germany’s VPPs, Simon said, but it’s starting to show up more. So far, the C&I customers participating in VPPs have tended to use generation like combined heat and power. German utilities have also started paying more attention to storage, by offering it themselves and investing in storage companies. State-mandated utility storage procurements in California have driven that state to the lead with 81 percent of the U.S. C&I market. German utilities haven’t gone that far -- they’re focused on residential and grid-scale storage at the moment -- but it’s a possible source of growth, if the government gives them a nudge. Ultimately, the growth of German commercial storage will depend on prices coming down from where they are today. The speed of that growth, though, could be helped by policies designed to create a monetary reward for the services storage can provide.